The Community Development Financial Institutions Fund (CDFI Fund) Minority Community Development Entity (CDE) New Markets Tax Credit Program (NMTC Program) Training and Technical Assistance Initiative Waitlist is now closed. Thank you for your interest. NCIF is proud to announce it has contracted with the U.S. Department of the Treasury’s Community Development Financial Institutions Fund (CDFI Fund) to implement Minority Community Development Entity (CDE) New Markets Tax Credit Program (NMTC Program) Training and Technical Assistance. Read the full announcement here. 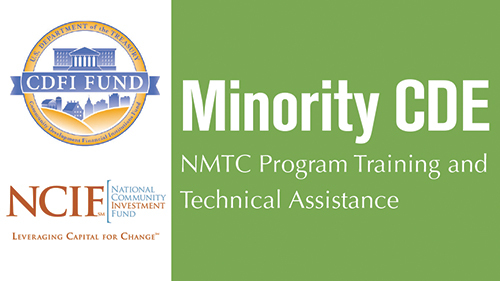 The 18-month program of group training and individual technical assistance is intended to inform Minority CDEs on how they can participate in the NMTC Program, including as a leverage lender, investor, allocatee, non-allocatee and/or secondary CDE. Whereas many Minority CDEs have faced heightened challenges in participating in the NMTC Program, the CDFI Fund created the program as an opportunity for Minority CDEs to identify and seek to address their specific challenges. After working with Minority CDEs to identify challenges during the assessment phase, NCIF will host up to four large trainings accessible to Minority CDE participants. Additionally, up to 25 Minority CDEs will be eligible to receive on-site technical assistance from NMTC experts. NCIF brings to the training and technical assistance experience from six rounds of NMTC allocations and involvement in the NMTC program since 2003. NCIF operates a unique three-way partnership model which involves a local CDFI in every NMTC project. This has given NCIF the opportunity to form relationships with many Minority CDEs and gain an understanding of their needs across time and the evolution of their underserved markets. In addition to our own capacities, NCIF is employing a collaborative approach to most effectively implement this training and technical assistance, leveraging the strengths of CDFIs, Minority Depository Institutions, investor partners and technical experts in needs assessment and the NMTC Program, all within the NCIF Network. Minority CDEs that are interested in more information as the program begins should contact the MCDE Desk at MCDEDesk@ncif.org.